View basket “Papo Carnotaurus Model (Papo Carnosauria)” has been added to your basket. A fantastic Papo Cryolophosaurus dinosaur model complete with an articulated lower jaw. An amazing Quetzalcoatlus flying reptile model by Papo. A Papo Quetzalcoatlus model complete with an articulated beak. A Papo Iguanodon dinosaur model. A superb Iguanodon model by Papo complete with an articulated jaw. A wonderful Polacanthus dinosaur model by Papo. A Papo Polacanthus dinosaur model. A super, hand-painted replica of the big crested Pterosaur known as Tupuxuara by Papo. A fantastic Papo Tupuxuara Pterosaur model. A hand-painted, museum quality model of the huge predator Spinosaurus, a super model dinosaur for creative play. A hand-painted, superb model of the giant dinosaur Brachiosaurus. A fantastic model of this long-necked dinosaur, a Papo Brachiosaurus dinosaur model. A hand-painted, museum quality, scale model of the fearsome Allosaurus, a superb model dinosaur for creative play. A fantastic model of a feathered Velociraptor by Papo. A Papo feathered Velociraptor dinosaur model. 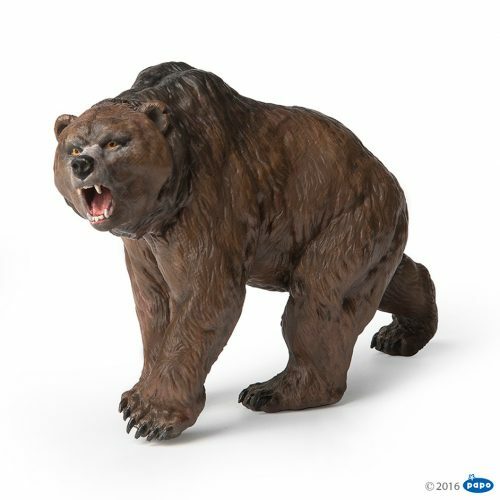 A Papo Cave Bear model, a fantastic model of a prehistoric bear (Ursus spelaeus) by Papo.